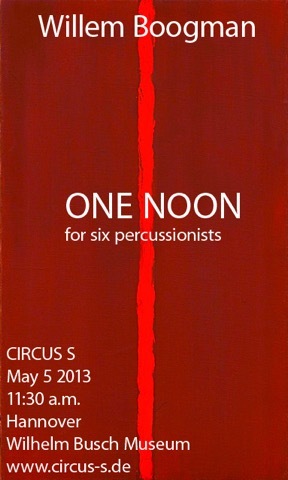 First performance of ›One Noon‹ for six percussionists by CIRCUS S.
›One Noon‹ is about twelve o’clock midday, when the sun is at its highest point and situated due south. At noon the world is at the centre of full daylight. The blazing sun in the sky, the shadows on earth, the refections and sparkles, the clouds passing in front of the sun, all caused me to deploy exclusively metal instruments for this celebration of noon. The percussionists are placed around the audience, making the sound rotation audible. I am very much looking forward to the premiere by the six percussionists of CIRCUS S in their circus tent. On May 5, 11:30 a.m. in Hannover.